Welcome to Ells Funeral Home online. 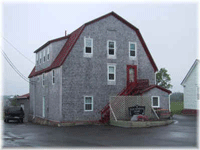 Our funeral business has been serving Grand Manan Island, New Brunswick since 1981. In addition to presenting our business to you, we offer you the opportunity to view our current Obituaries. You may have a memorial card placed, sign the guestbook or send a message. We are proud members of the New Brunswick Funeral Directors and Embalmers Association.